Beautiful detailed map of Africa. Highly decorative with fish, sea monsters and fauna. 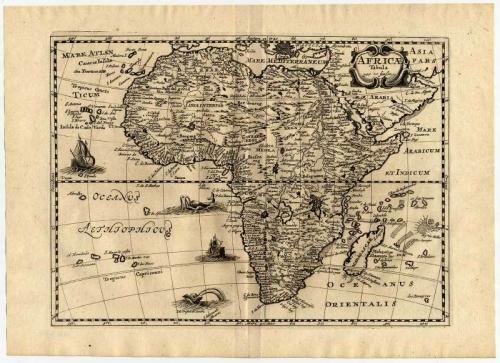 Description: This scarce map originates from: 'Curieuse aenmerckingen der bysonderste Oost en West-Indische verwonderens-waerdige dingen; nevens die van China, Africa, en andere gewesten des werelds. ', by S. de Vries, published in Utrecht by J. Ribbius, 1682. This splendid work on the curiosities encountered during the ages of exploration abroad contains 13 maps by Sanson d'Abbeville and many etched plates by Romeyn de Hooghe, which are considered some of the most interesting of his oeuvre. Ref: Sabin, 19854; Tiele, 260; Cat. NHSM, 240; Muller, 1565. Artists and Engravers: Author: Simon de Vries (Dutch 1524-1708): Poet, writer and translator, publisher, active in Utrecht. Carthographer: Nicholas Sanson d'Abbeville (1600 - 1667) and his descendents were important French cartographer's active through the 17th century. Sanson started his career as a historian where, it is said, he turned to cartography as a way to illustrate his historical studies. In the course of his research some of his fine maps came to the attention of King Louis XIII who, admiring the quality of his work, appointed Sanson 'Geographe Ordinaire du Roi'. Sanson's duties in this coved position included advising the King on matters of Geography and compiling the royal cartographic archive. Sanson's corpus of some three hundred maps initiated the golden age of French Cartography. Engraved by Antoine de Winter. Condition: Excellent. General age related toning and occasional light staining. Uncut. Original middle fold and margins as published.